Beyond the arc of the Carpathian mountain range, past the acres of dense pine forests, in the heart of ancient Romania, lies the fabled land of Transylvania. Once the nucleus of the Kingdom of Dacia, an ancient Indo-European race that dwelled around the Carpathian Mountains, Transylvania’s eclectic history has consists of a collection of breath-taking architecture and preserved beauty. 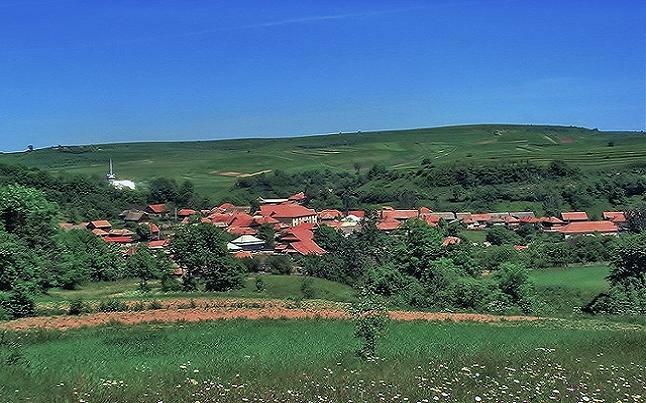 Rich in mineral resources and agriculture, Transylvania is a partly rural country where sheppards, carpenters, blacksmiths and weavers still trade profitably. 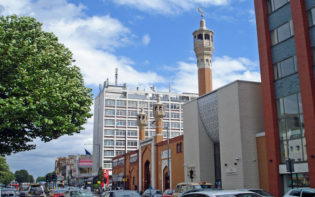 A blend of Hungarian, German and Romanian heritage creates a varied and colourful combination of cultures evident in local; costumes, cuisine, festivals and buildings. With Transylvania’s extended history of occupation and revolution, comes architecture of historic proportion, many of which are protected as UNESCO’s World Heritage Sites. Castles and churches are scattered throughout Transylvania and Romania itself, the 15th century Corvinilor Castle, near Hunedoara, and the mountain back-dropped Peleş Castle in Sinaia are just two examples of the gothic masterpieces Romania boasts. Unique to Transylvania are the Fortresses of the Orăştie Mountains and the Merry Cemetery, both of Dacian culture. The Dacian Fortresses were created in the 1st century as protection against Roman conquest. These 6 rings of protection are a clear evidence of an innovative ancient civilisation. 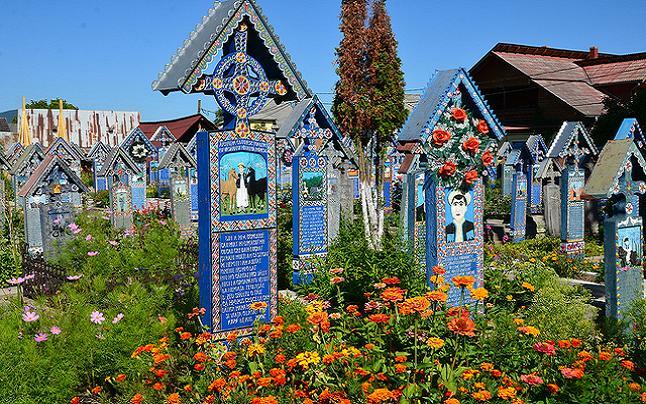 The Merry Cemetery of Săpănţa is now an open air museum filled with colourful tombstones and paintings that described the life and person of those buried there. Based on the Dacian culture of celebrating the beginning of a better afterlife, this cemetery is a unique experience and the only one of its kind. The towns within Transylvania lay claim to their own intrigue and hidden beauty. Straddling the Cibin river, Sibiu was named a European city of culture in 2007. 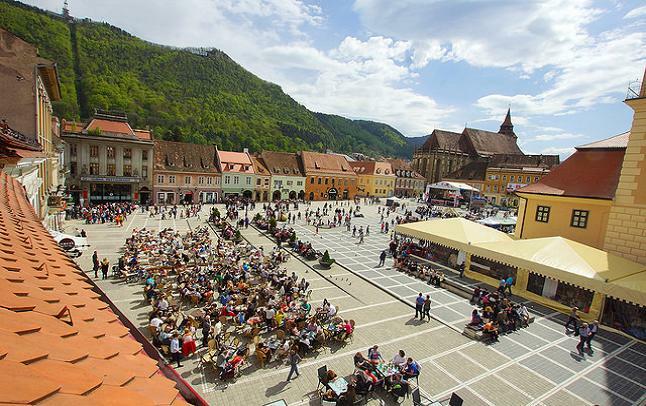 This fortified city and its theatres, Philharmonic Orchestra and pastel coloured houses prompted Forbes’ decision to name Sibiu as the 8th most idyllic place to live. Sighişoara was born from Transylvanian Saxons invited to settle and defend their new home, creating an irregular hexagon shaped town upon a Roman fort. The home of many artisans, the walled town of Sighişoara and its 14th century clock tower is the birthplace of Vlad III the Prince of Wallachia and originating inspiration for Bram Stoker’s Dracula. The connotations put upon Transylvania from Bram Stoker’s culture defining novel happened almost instantaneously. Vlad Dracul III was already a local folk hero of the 15th century, named Dracula, meaning son of the dragon, as his father Vlad II was inducted into the Order of the Dragon, an initiative to defend Christianity in Romania from the Turk occupancy. Bram Stoker created a firm link between vampires and Dracula by inducting Vlad III’s patronymic and the Transylvanian settings into his novel. Although the links to this legend are tenuous, Transylvanian locals have nourished the legend and the tourism it supplies. Sites such as Bran Castle – or Dracula’s Castle have become a destination highlight, especially around the months of October and November. Now an art museum, Bran Castle’s gothic setting still attracts those who believe in the legends of Count Dracula. Transylvania is a place of undisputed natural and architectural beauty and a land of mystery and legend. While Dracula may be the initial attraction of Transylvania, it has so much more to offer. Rich history and well-preserved historical sites combined with the friendly people who have embraced the supernatural stories that brought Transylvania to the attention of the English-speaking nations. 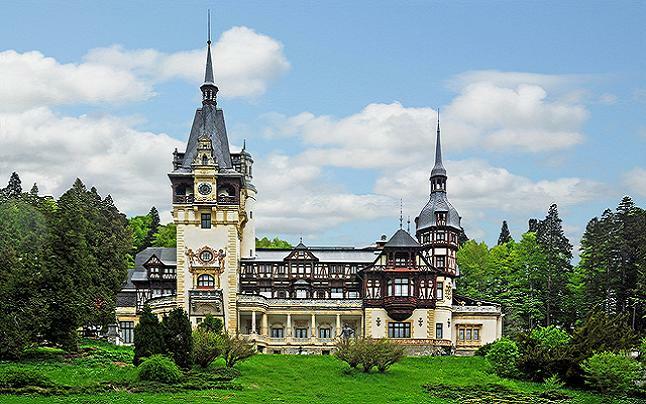 The Carpathian and Apuseni mountain ranges, gothic buildings and legendary mythology creates an unforgettable experience in an atmospheric setting. Bram stoker offered Transylvania a mythological legend that still continues today, how might popular culture be so influential?